I’d done my homework, but I was still nervous. It was April 1st, appropriately enough for me to make a fool of myself, muddle up my facts and my mind go blank. Overhead, whirling around the battlements, the gulls were laughing at me. But it went OK. My little group of early tourists shivered and huddled together on a blustery spring morning. They listened and smiled and even chuckled at my carefully inserted jokes. Phew. And since then, over years and successive seasons, I’ve been around the castle more than 2,000 times, with visitors from faraway countries, with fidgety school children, with earnest historians and happy-go-lucky backpackers. Yes, the castle is obviously the major attraction for any visitor to Caernarfon. Biased I might be, but it’s simply the mightiest and most magnificent medieval castle you can find – anywhere. Constructed for King Edward 1st, along with a chain of other castles at Conwy, Harlech and Beaumaris and all along the coast of North Wales, it was meant to be the headquarters of his conquest of Wales. The native Welsh prince, Llewelyn, had been ambushed and killed by English soldiers, and his head had been carried south to be displayed at the Tower of London. You can’t go to Caernarfon without visiting the castle and taking a tour. You’ll marvel at the sheer scale of its walls and towers. The guide will show you its terrifying array of murder-holes and portcullises. He’ll tell you how King Edward brought his wife here, Queen Eleanor of Castille, to have the child who would be entitled the first of the English princes of Wales, to cement his sway over the local Welsh and start a dynasty of English princes. By the way, every day and all year round, those pesky gulls will be cackling and swooping around you, as the guide regales you with his descriptions of the investitures of the modern Princes of Wales, in 1911 and most recently in 1969. They’ll laugh as he embellishes his tale that even Genghis Khan sent an emissary to pay homage to King Edward 1st right here in Caernarfon, with a leopard as his royal gift. They’ll fall respectfully silent as he boasts that nowadays Caernarfon is a World Heritage site, on a par with global wonders such as the Taj Mahal and Macchu Picchu and the pyramids of Giza. It’s a good tour of a great castle. And if you’re feeling fit, you’ll be taken to the top of the Eagle Tower, the highest point of the castle, for an exhilarating view of Caernarfon town and the surrounding countryside, to see the remains of a stone eagle which symbolized King Edward’s imperial rule over the territory of Wales and echoed the Roman conquest a thousand years earlier. But that view from the Eagle Tower should also inspire you to take a long and fascinating look into Caernarfon town and discover its many secrets. Yes, Caernarfon is more than the castle itself. The medieval walled town is one of the best examples in Britain and Europe. Take your time and wander through its narrow streets, along Hole in the Wall Street and Stryd Pedwar a Chwerch. You’ll be spoiled for choice, if you’re hungry and thirsty after your strenuous exercise up and down the towers of the castle. There are dozens of restaurants of all different kinds. The Black Boy is one of the oldest pubs in Wales, serving the best food and a great choice of beers. It’s haunted too, if you dare to check in and stay the night in one of its comfortably ancient rooms – a few years ago the skeleton of a woman with no feet was unearthed in its car park; perhaps she still goes tiptoeing along the Black Boy’s creaking corridors. 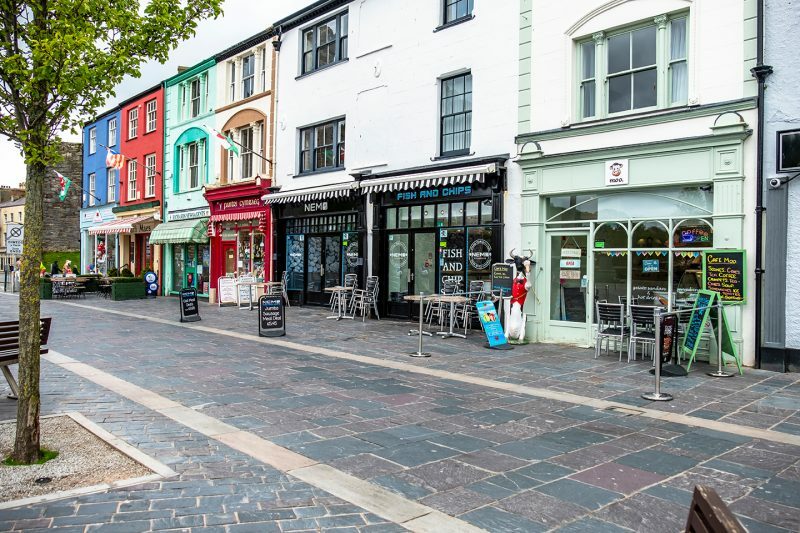 On the town square there’s the very excellent Caffi Maes and the smallest bar in Wales, perfect places to enjoy delicious local food, to relax and sit and watch the world going by, to hear the cries of those gulls. The gulls? Love them or hate them, they’re a highly visible and very vocal part of this seaside town. Some people think they’re the souls of sailors lost at sea, wailing all day and into the night. Indeed, Caernarfon has a long seafaring tradition. Ships have sailed from the Slate Quay to distant destinations all around the world, with cargoes of slate and many adventurous emigrants to America and Patagonia, to establish colonies where Welsh is still spoken today. These days, the Slate Quay is a car park, but also a popular sun-trap know by locals as the South of France, where you can enjoy long summer days and evenings with a beer or an ice-cream, while the children catch crabs in the Seiont river. And so much else to do and enjoy! My favourites? A cruise on a lovely old boat, the Queen of the Sea, and she’ll take you out of the river and bravely butting into a blustery headwind on the Menai Strait, all the way to Fort Belan on the Foryd estuary, before turning and hurrying back with a following current. A walk across the Seiont footbridge brings you into Coed Elen, named for the long-ago Queen Eleanor – a delightful woodland of lime and beech and oak, in the springtime a magical place of bluebells and garlic and the song of the wren, and in the autumn a roaring of wind in the treetops. And enjoy a pint on the sea-wall at the Anglesey Arms, maybe the best place in the world to watch the sun go down. Always, wherever you go in the town, you turn and marvel at the overwhelming bulk of the castle … and yet you still find time to explore the streets for the ghosts and spirits of a long and intriguing past. For here, in and around this rumbustious seaside town, you can hark back to the times of the Romans and visit their settlement called Segontium; you can dream the dreams of the Mabinogion and the legends of Macsen Wledig; you can find the old morgue, to which the unfortunate victims of an epidemic of diptheria were brought; on a dark evening, you can pause at the Bell Tower and recall the curfew which signaled the closing of the medieval gates; you can wonder where the first English prince of Wales was born in 1284, who would become King Edward 2nd and meet a ghastly demise, murdered horribly in Berkeley Castle. And while the gulls shriek and wail along the sea-front, you can linger in Porth yr Aur and look up into the vaulted archway, from where the last man to be executed in Caernarfon was hanged. Today it’s a busy, vibrant town, where the past and the present nudge and nestle more or less comfortably. A living example of this notion: the old Victoria Dock has been marvellously updated, with a state-of-the-art complex of apartments and hotels and bars, and the Galeri arts centre, a superbly innovative theatre/cinema featuring thought-provoking films, live drama and comedy and music. Caernarfon, a place of ghosts and gulls – oh, and thousands of tourists from all over the world. And incomers and newcomers, of course. And the locals, proud of their heritage, protective of their language, and yet warm and welcoming to everyone, to their old foes and their many new friends. Let the gulls cackle and shriek, I say. They’ve seen it all. They’ve watched the Romans come and conquer and settle. They’ve seen Welsh and English princes struggle for dominion. They’ve whirled over royal investitures. They’ve laughed along with Shakespearean plays and carnivals and festivals and even rock bands inside the castle. And they’ve chuckled at this castle guide, humouring his little jokes … another newcomer who thinks, misguidedly, that he’s a bit of an expert because he’s doing his 2,000th tour. Ladies and gentlemen, welcome to Caernarfon!